WHO WAS RASPUTIN “THE MAD MONK”? Interlocutor: Moving on to another topic that I consider very interesting to publish in Unveiled Enigmas and on the website, it is related to the story of Rasputin and the Romanovs. The first question is, What abilities did Rasputin have when he alleviated successfully the hemophilia of Alexei, the son of the tsars Nicholas II and Alexandra? The doctors of that time were not able to do it. Ruanel: That incarnated being whose name was actually Grigori Yefimovich, since the name Rasputin was put to him in his town because it described him from head to toe, since it means "dissolute". He had the gift of healing with his hands, through vibrations, the auric field and therefore he also cured indirectly the physical body. Interlocutor: I thought something like that. 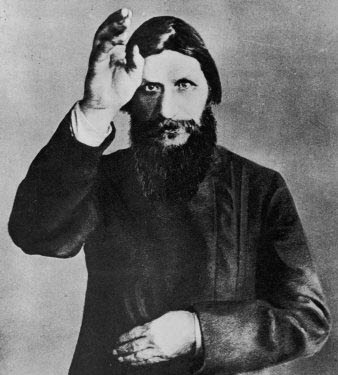 Did Rasputin know where his powers come from? Ruanel: He didn't discern too much about the issue. He thought he had a divine gift, but his reactive mind had control over him and it transformed him in a complete egocentric being. Generally, in people who exercise power, the reactive mind grows disproportionately and it makes the person believe that he is almost a God. All those who lose humility are surpassed by their gift to such point that it makes them perverse. Interlocutor: Did he cure Alexei from the hemophilia or he only alleviated him during the crisis? Ruanel: He only alleviated him. Interlocutor: Obviously all that happened to the Romanov family was karmatic. Is this correct? Interlocutor: As you surely know, Rasputin was poisoned, but the curious thing is that the dose of poison he received in the pastries was so powerful to kill several horses. However he didn't die poisoned, but drowned when they toss him to the river believing that he was dead. How could something like that happen? Ruanel: Obviously when he was with the attacks he would generate colors or energies thinking in that way that he could revert the situation. He almost did it. Interlocutor: The obvious question now is how Rasputín didn't realize he would be poisoned? Ruanel: The answer is very simple: he was incarnated. Don't forget that the physical plane has its limitations. Interlocutor: I understand. Moving on to the Romanovs, we know that the Bolsheviks executed the whole family - Nicholas II, his wife Alexandra, and their children Olga, Tatiana, Maria, Anastasia and Alexei - and after they were dead, they were cut into pieces and buried so nobody knew what had happened to them. But the curious thing is that decades later, when they located their bones, the bodies of the Romanov family were recovered, but the bodies of Anastasia and Alexei were not found. The reason was never known and it was thought that both of them could have escaped somehow. But the mystery subsists. It is even notorious that somebody alleged to be Anastasia and she claimed her rights, but the justice denied it. Later, through DNA analysis, they determined precisely that she was not Anastasia and the mystery of her disappearance grew more. Ruanel: The disappearance of the two siblings has to do with time travels. We are going to unveil it in other session, but now I can tell you that they traveled to another time. Alexei survived and he even built an artifact like to change the past. This artifact is independent of the time machine that Kronbus used. Alexei built a different device by means of a similar physics to quantum physics where one could go through a portal. Interlocutor: Where in time were Anastasia and Alexei transferred? Interlocutor: Obviously they were transferred by some time traveler. Ruanel: Something similar. But it would be necessary to deepen on the topic. This entry was posted at Wednesday, July 22, 2009 and is filed under Who are they? . You can follow any responses to this entry through the .